From the latest reports on U.S. election interference and Special Counsel Robert Mueller’s investigation, Russia seems to get all the attention in today’s headlines. But questions and concerns about U.S.-Russian relations isn’t new. Antagonism between the two countries has long had a major impact around the world and influenced the course of global history. The struggle peaked during the four decades of the Cold War and the arms race, which came to a close in early 1990s, ushering in an era of cooperation in foreign policy between the two nations. For researchers interested in the impending fall of the Soviet Union, its effect on Europe and international policy, and the historic relationship between the U.S. and Russia, the latest collection in partnership with the National Security Archives is a boon of primary source information. 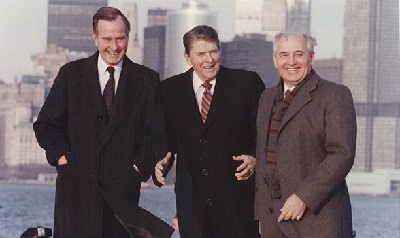 Learn more about the Soviet-U.S. Relations: The End of the Cold War, 1985-1991, now available digitally from ProQuest, in this detailed description adapted from the National Security Archive blog, Unredacted. From early exchanges of letters between U.S. president Ronald Reagan and Soviet leader Mikhail Gorbachev after the latter came to power in March 1985, to Gorbachev’s last phone call with Reagan successor George H.W. Bush on December 31, 1991, these documents show the development of a productive relationship based on trust and a mutual interest in reversing the arms race, resulting in spectacular achievements across the entire spectrum of foreign policy issues for both countries and domestic reform in the U.S.S.R. Throughout the seven years covered in the set, U.S.-Soviet cooperation produced major advances in bilateral relations and in resolving third-world conflicts. In the most important area of arms control, the two countries signed the Intermediate Nuclear Forces Treaty in December 1987, which eliminated an entire class of nuclear weapons for the first time in history. In 1990, members of NATO and the Warsaw Treaty Organization signed the Conventional Forces in Europe (CFE) Treaty, reducing force levels in Europe. In July 1991, at the Moscow Summit, Bush and Gorbachev signed the START I Treaty which decreased numbers of strategic nuclear arms. Documents on negotiations of these treaties from both sides are part of this set, including very rare verbatim records of military-to-military negotiations from the Soviet side. The end of the Cold War and the new partnership between the United States and the Soviet Union allowed the superpowers to actively engage in mediation of third-world disputes, often putting pressure on their own allies in the local conflicts to resolve them peacefully. Primary sources documenting U.S.-Soviet negotiations and joint work on issues such as ending the Soviet war in Afghanistan, negotiating peace in Southern Africa and Central America, and promoting democratic elections in Nicaragua show how far both the U.S. and Soviet Union were willing to go in the transformation of international relations and alliances. In Europe, where the effect of the end of the Cold War was most dramatic, this collection covers the withdrawal of Soviet troops from Eastern Europe, the evolution of Gorbachev’s idea of the “common European home,” Bush’s concept of “Europe whole and free,” and the interactions of both U.S. and Soviet officials with leaders of East European countries. Discussions of German unification and the related issues of the future of NATO and the Warsaw Pact also constitute an important facet of the collection. U.S. documents in this collection were obtained through Freedom of Information Act (FOIA) requests to the State Department, the Defense Department, the CIA and the Clinton and Bush presidential libraries. On the Soviet side, notes of Politburo sessions produced by official stenographers and by Gorbachev’s chief foreign policy adviser Anatoly S. Chernyaev document crucial Soviet discussions and evolving cooperative policy toward the United States. Soviet materials relating to the period covered in the set were obtained by National Security Archive staff with the cooperation of the Gorbachev Foundation in Moscow and from declassifications in key Russian archives. Learn more about the Digital National Security Archive (DNSA) collections from ProQuest and sign up for a free trial today.